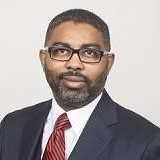 Donald Prophete is a trial attorney for Constangy, Brooks, Smith & Prophete, LLP, based in Kansas. He has been practicing law for over twenty years and has been intrigued to practice since the young age of six years old. He specializes in trial law for mainly employment disputes, but also is engaged in law advisement and practice for major sports corporations, i.e, the NFL, NBA, and MLB. In the next few years, Donald hopes to expand the firm internationally, doubling attorney size while creating a more diverse staff in legal ranks. Donald earned his JD from Boston University School of Law, class of 1992. Prior to his current position, he worked as a partner with Littler Mendelson and served as a Board Member for Ogletree Deakins. He published a chapter in "Sports Law Practice Book” in 2014, has gained much recognition and awards for his excellence, and belongs to the American Bar Association, Missouri Bar Association, National Bar Association, and the Hispanic Bar Association. He serves on the Board of Directors for Harvesters Community Food Networks.